Longer gives your windward rail more lift. Wider gives you superior low end. Thinner is always faster, if you can power it up with your sail. That "1/2" mph might be closer to 1/4, who knows, but that's NOT the main reason for finishing a fin correctly. The main reason is to keep higher average speeds, so you're not slowing down in the lulls, then needing to speed up again in the gusts. "Going from chemistry, doesn't water have very strong cohesion?" Frankly, I couldn't tell you, as my chemistry background is practically non-existent. However, what I do know is that if you sand a surface water will readily adhere to it. I learned that with surfboards going back to the late 60s. Unfortunately, sanding a surface allows other materials to stick to it too, particularly dust and dirt particles. So once you start sanding a surface, you need to keep it maintained. If the truth be told about this topic, experts exist on both sides of the argument (highly polished versus lightly sanded), so dragging out some local expert as spennie has done here is very questionable. But the idea that if you sand your fins you will have spin-out problems is laughable. I think most of us understand that non-weed related spin-out problems is due to poor technique. I've heavily sanded well over 20 fins, and while I can get humming, some extra drag, lack of adaquate lift, I've never gotten a fin to spin out, if it's attached solidly to the finbox. I DO have some stock fins, unmodified, that spin out if you look at it wrong. All you fin guys should check this out. Looks like leading-edge tubercles can delay stall. Gary: There's your next project! Pay close attention to the name of the last author! If you google-scholar F.E. Fish, you'll see he knows a lot about fins! AHAH! We've found a skill you lack! I can spin out any and every fin I've ever sailed! Oh, wait ... maybe that means *I'M* the one lacking a skill. So who's willing to sacrifice a fin, get out the drum sander and give the tubercle idea a try? Googling images of "humpback whale fin" will provide plenty of models. 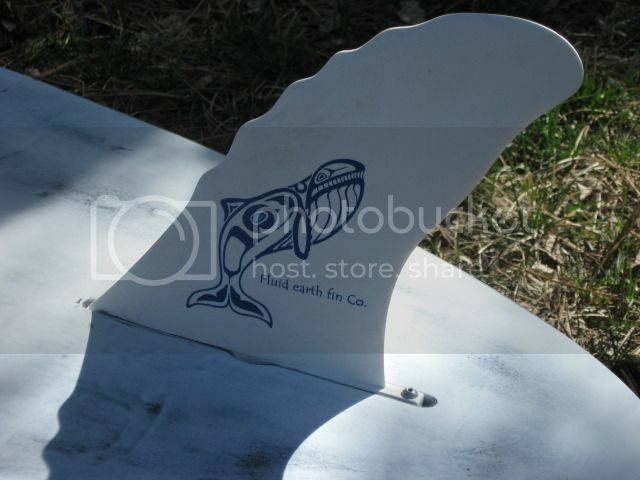 There is actually a striking similarity between the profiles of a HB whale fin and a basic freeride fin. A few whales were killed in the making of this fin but it was totally worth it. Well, you can drill holes front to back in your fins, cut out the base, add a small forefin, glue a vent across the tip, even two, or 3, or shape it so the base goes forwards before sweeping back, or use 2 equal sized blades fore and aft, but you're still going slower than a normal fin. To go faster, decrease area drag while maintaining some length for lift at high speed. Spennie, my post on sanding fins took as an assumption that the fin in question was flawed in some way, either by damage or surface paint. Your professor sails non-plaining boats that operate in very different conditions than windsurfer fins. A grain of sand on a keel means nothing compared to that grain of sand on a fin. Likewise the screening of paint used for art or branding. That stuff changes the foil and is the only reason Techtonics et al do not paint designs on the foil. Sanding the board is to clean it. Sanding the fin is to repair. Scotch pad is to clean the fin. 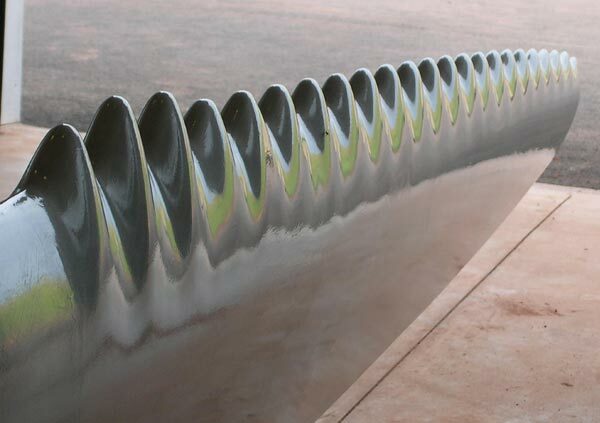 I agree 100% that one should not sand the fin to try to re-foil it in an effort to improve its performance except to blunt the trailing edge when necessary and when one is willing to risk destroying a perfectly acceptable fin.